A guide to everything from Tianjin business hotels and Nanjing newbies to small corporate meetings in Ningbo and Xiamen luxury hotels; and high speed trains. THERE was a time when travellers to China were wary of venturing beyond the relative security and sophistication of Beijing and Shanghai. To do so, often meant long and uncomfortable journeys or frustrating flight delays, uninspiring hotels and an array of ‘lost in translation’ moments. China’s expanding high-speed rail network (now covering 8,600km and counting), upgraded airports and improving flight routes are bringing many second and third-tier Chinese cities onto the travel radar. East-coast urban centres such as Tianjin, Qingdao, Nanjing and Suzhou are emerging as hotbeds of economic development and are looking to lure travellers to venture beyond the gateway cities with impressive new urban infrastructure, luxury hotels and entertainment options – usually at more competitive prices than the established cities. And far in the south is the tropical playground of Sanya in Hainan Island. A bit of general advice for those looking to explore farther afield in China. For shorter trips (within three hours), we’re big fans of rail over air travel. Prices for both modes tend to be similar, depending on when you book, however flights still often suffer delays due to the government’s steely grip on air space. The snub-nosed, high-speed ‘G’ trains are comfortable, run perfectly to time and usually deliver visitors to stations that are close to downtown. They have large tray tables and (three pronged) power sockets – handy if you need to work en route. First Class treats you to slightly roomier, red-velvet seats and a few snacks, but Second Class is a perfectly comfortable option. As the trains are very popular, it’s recommended to book several days in advance as tickets do sell out, especially on popular routes. Train timetables in English can be found at Travel China Guide, which also has a handy app called China Trains that enables ticket bookings. Most hotel concierges should be able to purchase tickets for you for a small fee, which means avoiding queues at train stations and ticket offices. You’ll need to present your passport when purchasing the ticket. Other useful sites within China for flight and hotel bookings are eLong and CTrip. Both have websites and hotlines available in English. It’s quite easy to get the hang of zipping around China. The new train stations and airports begin to feel eerily identical and are generally clearly signposted in Chinese and English. Double check your precise departure and arrival stations as many cities now have multiple major train stations at different compass points, which can be long distances from each other. Arrive at the station with time to spare, as you will need to go through security and ticket checks. Gates open around 10-15 minutes before the train’s arrival allowing the hoards of passengers to file through turnstiles and down to the platform. Seats are clearly allocated, so check your ticket for the correct car/seat number. And be sure to keep your ticket handy as you sometimes need to show it on the train as well as when you leave the station at your destination. Train stations and airports generally have integrated taxi queues with metered taxis (never follow touts at the arrivals area claiming to be taxi drivers). Especially if you are new to a city and don’t speak Chinese, it’s often worth arranging a hotel pick-up to bypass long taxi queues and cab driver communication difficulties, as drivers all across China rarely speak any English. So, now you’re set. The Middle Kingdom is your oyster. Here are a few great up-and-coming cities along China’s east coast – each with an amazing history and memorable scenery – that you can easily reach by plane and train from Shanghai or Beijing, or fly directly into their international airports. Tianjin is home to China’s fourth largest urban population after Shanghai, Beijing and Guangzhou, and is one of four city municipalities (with Shanghai, Beijing and Chongqing) directly controlled by the central government. Despite such clout, and the fact that it resides just 80 miles southwest from Beijing, this city of 12.9 million has remained largely off the tourist radar – until now. Located on the Bohai Gulf, Tianjin has been a major seaport and a transport gateway to the capital Beijing since the mid-19th century. Opened as a ‘treaty port’ after the second Opium War (between the UK and China) in 1859, Tianjin was carved into eight foreign-run concessions bifurcated by the attractive Hai River. The city’s exotic architectural legacy remains, particularly in the former British, French and Italian concessions and the cosmopolitan habits of its local residents. Even newly built developments tend to elaborate Tianjin’s timeless gables and neoclassical embellishments. Modern Tianjin received a boost with the opening of a high-speed rail line from Beijing in 2008, linking the cities in a zippy 28 minutes. Tianjin is also a direct stop on the popular Shanghai to Beijing route, taking precisely five hours from Shanghai. Pay heed to which station you’ll be alighting at. The massive new Tianjin West Station is about 20 minutes’ drive from the city centre, and connects directly to metro Line 1. Equally shiny and modern, Tianjin South Station is around 40 minutes from downtown. The older Tianjin Central Station delivers you into the heart of the city centre beside the Hai River. Taxis around town are plentiful, and fares start from just Rmb8. For shorter hops, the open-sided three-wheeler motorised bikes are a fun way to explore the city and manage to avoid traffic jams at peak hours. You’ll have to haggle, but Rmb10-Rmb15 for short distances is standard. Tianjin is home to China’s oldest surviving international luxury hotel – The Astor Tianjin ([86-22] 2331-1688, astortianjinhotel.com/) – and a new crop of luxury properties is sprouting across the city. For visitors with a penchant for nostalgia, you can’t beat The Astor. 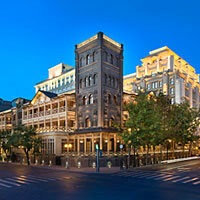 The British Victorian landmark, which celebrated its 150th anniversary in 2013, received a Rmb300 million makeover in 2010 when it became the first Starwood Luxury Collection hotel in China and retains just the right balance of heritage, creaky-floored charm and modern-day comforts, like hotel-wide WiFi and high-pressure showers. Be sure to book a room in the original Astor Wing rather than the more modern (and rather bland) Hai River Wing, and don’t miss the large Astor Museum in the basement documenting the remarkable history of this Tianjin icon. The management of this hotel may be in flux. Do check. Another great base is Tangla Tianjin ([86-22] 2321-5888, tanglahoteltianjin.com/), which towers 48 storeys over the busy financial and retail district of Nanjing Road, opposite the bronze-capped St Joseph’s Cathedral built in 1931. A recipient of the American Academy of Hospitality Sciences ‘Six Star Diamond Award’, Tangla’s classically elegant navy and taupe guestrooms start at a spacious 60sq m, a fair amount of which is reserved for the indulgent marble bathroom complete with window-front bathtub and Moulton Brown bath products. 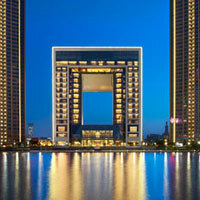 At the luxury end, the Tianjin business hotels roll call is growing apace with other swish options including the unmistakable St Regis Tianjin ([86-22] 5830-9999, www.starwoodhotels.com) in a striking glass cube beside the river with Deluxe Rooms serving up a 40-inch flat-screen TV, Blue-ray DVD player, B&O sound, and iPod docks for road warriors. Enjoy grand views from the St Regis Bar, unwind with a big menu of wellness treatments at the Iridium Spa or tuck into dome fine dining - French and Italian to Cantonese. 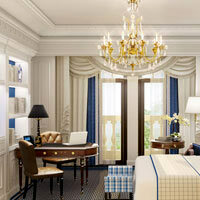 The 274 rooms are spacious with plush finish and classical touches, many with grand views across the water. Also look at the funky Hotel Indigo Tianjin Haihe ([86-22] 8832-8888, www.ihg.com/hotelindigo/) housed across several German-style villas; and Banyan Tree Tianjin Riverside ([86-22] 5861-9998, www.banyantree.com), bringing its urban resort-style ambience to the riverside. The gorgeous Ritz-Carlton Tianjin (late 2013; [86-22] 5857-8888, www.ritzcarlton.com/en/Properties/Tianjin/) in a faux-neoclassical building beside Hai River features a Flair bar, Ritz-Carlton Spa and Club Lounge among its luxurious facilities. Make time if you can for a sunset cruise along the Hai River, which meanders right through the city, or go for a spin on the Tianjin Eye, a 120-metre Ferris wheel that straddles the river over Yongle Bridge. One of the best places to view Tianjin’s rich architectural legacy is along Jiefang Bei Lu. Originally named Victoria Avenue, this was the main thoroughfare of Tianjin’s British Concession and is lined with the aged grand granite frontages of former banking headquarters, offices and municipal buildings. Wu Da Dao is another area clustered with stately European-style garden villas, while leafy Chifeng Dao buzzes with daily life and is home to the eye-popping China House Museum, entirely coated in hundreds of thousands of pieces of porcelain. This area is also close to Goubuli, signature purveyor of Tianjin’s best-loved doughy steamed dumplings. Look for the colourfully painted traditional façade. Another trendy spot for a bite is Café Sambal (www.cafesambal.com), a cool Malaysian restaurant in a renovated courtyard dwelling. Historically one of China’s most important cities, Nanjing – meaning ‘Southern Capital’ – was one of the four great capitals of ancient China, along with Beijing, Luoyang and Xi’an. The city was the base of six dynasties from AD229, and capital of the Republic of China between 1912 and 1949. Today, Nanjing, which is located 300km northwest of Shanghai beside the Yangtze River, is the capital of Jiangsu province. History and prestige may have defined Nanjing’s past, but the city has been slower to develop than its competitive neighbours in the Yangtze River Delta, like Hangzhou, Suzhou and Wuxi. However, it rose to some prominence as the host city of the 2014 Summer Youth Olympic Games (www.nanjing2014.org). The first new Games created by the Olympic Movement in 80 years, the inaugural Youth Olympic Games was held in Singapore in 2010. The 2014 Games were held from 16-28 August 2014, bringing together some 3,600 athletes aged between 14 and 17 from 204 nations. These young athletes competed in 15 sports, ranging from swimming, fencing and football to golf, badminton and judo. It’s a tremendous boon for Nanjing which, like many Chinese cities – Beijing’s 2008 Olympics, Shanghai’s 2010 World Expo, Guangzhou’s 2010 Asian Games, for example – has leveraged a major international event to invest in a citywide transformation. A year ahead of the Games, the Olympic mascot ‘Nanjing Lele’, inspired by Nanjing’s prized river stones, was omnipresent and the city reverberated with the sounds of construction as towers spring up, new metro lines being built and heritage buildings getting a refresh. High-speed trains arrive at the huge new Nanjing South Railway Station – a mega-structure said to be one of the biggest stations in the world in terms of floor area, stretching over 458,000sq m with 28 platforms and 128 escalators. There’s even a Starbucks and Costa Coffee at the entrance. It’s a major intersection between several intercity lines, including the Shanghai-Beijing line and a new Nanjing-Hangzhou line, which bypasses Shanghai and cuts travel time between the cities to 90 minutes. The station is built on a hill, providing great views over Nanjing, and is only a short ride to downtown. Metro Line 1 connects in the basement. Nanjing Lukou International Airport serves national and international flights, including routes to Japan, Korea, Thailand, Malaysia, Singapore and Germany. Taxis start at Rmb11 and strap in – Nanjing drivers tend to be a bit on the wild side. Newcomer Fairmont Nanjing (1 November, 2013, tel: [86-25] 8672-8888, www.fairmont.com/nanjing/) from the lux top-drawer Raffles family, is a startling vertical construct, dazzlingly modern, in a city of temples and lakes. Close to the international airport and expo hall, the Fairmont is perched in the upper reaches of the Jin Ao tower that resembles a hi-tech Chinese lantern. Highly textured rooms in grey-beige pastel tones offer comfy beds for weary suits with 46-inch flat-screen TVs, laptop-friendly safes, and rain showers. There are seven restaurants and bars as well as babysitting services for weekend trippers. Many upscale international hotels have announced upcoming openings in Nanjing, including Shangri-La and St Regis. Located in the 450-metre Zifeng Tower, currently Nanjing’s loftiest skyscraper, InterContinental Nanjing ([86-25] 8353-8888, www.ihg.com/intercontinental/) offers hip design and modern comforts. The 433 rooms are located between the 49th and 71st floors ensuring top of the city views from the heart of downtown near the Nanjing Drum Tower. Chic bar and restaurant Prime sits on the 78th floor. 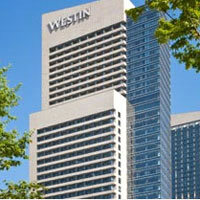 Nearby, The Westin Nanjing ([86-25] 8556-8888, www.starwoodhotels.com/westin/) features 234 contemporary guestrooms overlooking Xuanwu Lake, all with the Westin Heavenly Beds and 42-inch TVs. Mark this down as a useful Nanjing business hotels choice. A great serviced apartment long stay option in the Hexi New Town, Fraser Suites ([86-25] 8626-8888, nanjing.frasershospitality.com) offers comfy one to three-bedroom suites with home theatre systems, mini kitchens and balconies, plus a suite of sporty facilities including a swimming pool, gym, indoor squash and badminton courts. Be sure to set aside some time to visit Nanjing’s abundant sites, especially around Purple Mountain. The mountaintop Zhongshan Scenic Area is home to the majestic Sun Yat-Sen Mausoleum, Xiaoling Tomb of the Ming Dynasty and Linggu Pagoda, plus leafy hiking trails. The vast Presidential Palace dates back six centuries, and the Nanjing Massacre Memorial Hall is a haunting reminder of dark times during Japan’s pre-War occupation of Nanjing on the site of a former mass burial ground. When it comes to dining, try Nanjing specialities like salted duck and lion’s head meatballs. And for nightlife, head to the 1912 bar and entertainment district housed in grey-brick buildings dating from, you guessed it, 1912. Just 30 minutes by high-speed train from Shanghai, Suzhou is a popular excursion trip from Shanghai on account of its picturesque gardens, temples and laidback ways. But don’t let the relaxed mood fool you – Suzhou is also an ambitious city, looking to step out of nearby Shanghai’s spotlight and lure corporate groups and leisure travellers with luxurious hotels, impressive exhibition venues and entertainment options at better prices. There’s fun stuff for families too. An ancient water city, often dubbed the Venice of the East, Suzhou is best known for its many classical gardens, which are inscribed as UNESCO World Heritage Sites. Old canals spanned by arched stone bridges and lined with traditional whitewashed houses can still be found in the older neighbourhoods. Meanwhile, new Suzhou has expanded on either side of the Old Town. Suzhou Industrial Park (SIP), a cooperation between the Chinese and Singaporean governments, fans out to the east around Jinji Lake and Suzhou New District extends to the west. 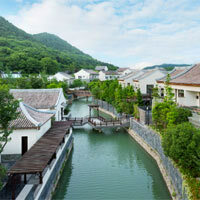 Suzhou is located on the Shanghai-Beijing high-speed rail line. There are several stations servicing the city, including one in the SIP district – handy, as many of the newer hotels, convention venues and entertainment districts are located in this part of the city. InterContinental Suzhou ([86-512] 6285-8888, www.ihg.com/intercontinental/) is one of Suzhou’s most impressive hotel options. Right on the banks of Jinji Lake, the 27-storey crescent shaped hotel features 432 contemporary rooms with panoramic views of the willow-fringed Jinji Lake and new Suzhou skyline. A great penthouse Executive Lounge with a rooftop terrace is worth upgrading to. Fancy sleeping in an historic Suzhou garden? Garden Hotel Suzhou ([86-512] 6778-6778, www.gardenhotelsuzhou.com) is a storied state guesthouse dating back to the early 1900s. It offers comfortable rooms and a large wellness centre set amidst manicured gardens in the old town. For something rather wackier, rev things up a notch at the flash 92-room Suzhou Tonino Lamborghini Boutique Hotel ([86-512] 6285-9999, www.tlhotelsgroup.com/suzhou/) beside Jinji Lake. Nearby, the 44-room Regalia Resort & Spa Li Gong Di Suzhou ( 115-3388) has a resort-like ambience with its Thai-style décor and outdoor pool surrounded by stone elephants. Service is somewhat lacklustre but the over-water spa cabanas and lakeside terrace are tops. There’s plenty of evening action to be found around the vast Jinji Lake, including year-round performances at the Suzhou Science and Cultural Arts Centre, colourful lake cruises, a giant Ferris wheel and a nightly fireworks and laser light show. The lakeside leisure area of Ligongdi is home to a popular bar street and several local and international restaurants. Be sure to wear comfortable walking shoes for a trip to the must-see Suzhou gardens. “Recreating natural landscapes in miniature… they are masterpieces of the genre” is how UNESCO describes Suzhou’s famed water gardens, eight of which are listed as World Heritage Sites. The Humble Administrator’s Garden is the largest and most famous, endowed with beautiful lawns, bamboo forests, flower gardens, ornate rockeries, giant goldfish ponds and, at peak times, hordes of visitors. Master of Nets Garden is another of our favourites. Also in the Old Town, Suzhou Museum designed by I M Pei (the architect who grafted a glass pyramid onto the stately Louvre museum in Paris), is one of the region’s finest museums and is well worth a visit, as is a stroll along Pingjiang Road, a canal-side market street dating back a thousand years. If a reviving coffee is in order, stop by the charming Bookworm Café. The pretty seaside capital of northern Liaoning province, Dalian occupies a narrow isthmus surrounded by the Yellow Sea and Bohai Sea. China's northernmost warm water port serves as a strategic international shipping centre and logistics hub as well as a regional financial and IT base. Dalian’s many beaches, mountains and hot springs, in addition to its European-influenced heritage architecture, are a draw for tourists and leisure travellers. Adjacent to the harbour and Dalian International Convention Centre, the Conrad Dalian ([86-411] 8677-6666, conradhotels.hilton.com) offers 210 deluxe guestrooms, including 90 executive rooms and suites. Sample Dalian’s famed seafood at The Sea Grill and Wine Bar. Luxury hotel stalwart, Shangri-La Dalian ([86-411] 8252-5000, www.shangri-la.com/dalian) offers a convenient city centre location and 563 elegant guestrooms, plus a Horizon Club. We all know the Chinese are adept at copying stuff but The Castle Hotel Dalian (opened September 2014, [86-411] 8656-0000, www.starwoodhotels.com/luxury/) takes things up a notch with a stomping recreation of a Rhineland castle - this from Starwood's Luxury Collection - complete with huge stone battlements, slate-grey turrets and crenellated walls. Built atop a low hill, this grand edifice dominates the landscape and towers over the nearby Xinghai Square. The high ceiling all-white lobby features a skylight roof with archways, pillars, inlaid marble floors, regal seating and a grand staircase, all right out of Vienna. 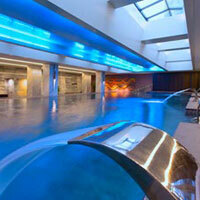 Apres-work for suits on the go, wind-down options include the Kaiser Spa, an indoor pool, and a generous fitness centre. 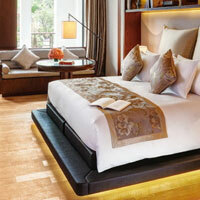 The 50-60sq m Grand Rooms are accoutred in a warm palette with luxe fittings, a soaking tub and high end toiletries. The large flat screen television is for after the rain shower pummelling when you settle into your Luxury Collection bed. Expect an iron and ironing board, fast internet, twin vanities for him and her, pillow menu for aristocratic heads and a humidifier (if requested). One Bedroom Suites can stretch from 70sq m to 260sq m while the Presidential Suite is a whopping 620sq m. The 292-room hotel is sumptuous in part and overpowering in others with its mix of lavish finery and faux-Euro whimsy. 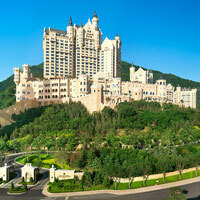 But its big strength is as a top Dalian conference hotels choice. Stage a mega event in the 1,400sq m pillarless grand ballroom, or pick from two junior ballrooms, an outdoor terrace and versatile function rooms. There's a staggering 2,650sq m for MICE but this is a good spot too for small corporate meetings in Dalian should your multinational colleagues wander into town. And unimpeded views stretch for miles over hills or sea in all directions. It’s best to fly to Dalian from Beijing and Shanghai. Heading further north, a new 921km Harbin-Dalian high-speed railway connects the cities of Dalian, Shenyang, Changchun and Harbin in around three hours. It is the world's first high-speed railway in areas with extremely low winter temperatures. 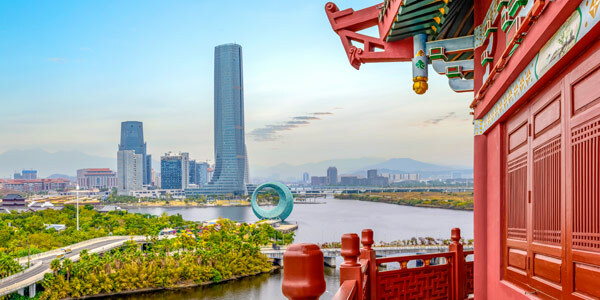 A two-and-a-half-hour drive south from Shanghai via the 36km Hangzhou Bay Bridge and you arrive at the thriving seaport city of Ningbo, facing Hangzhou Bay and the East China Sea. A new G train route links Shanghai and Ningbo East station in just over two hours and Ningbo Lishe International Airport services flights from across China, plus Hong Kong, Taipei and Singapore. An important trading city on the ancient Silk Road, Ningbo is now home to the world’s largest deep-water port and forms a ‘golden triangle’ of manufacturing and commerce with Shanghai and Hangzhou. Eat up, because Ningbo’s seafood is renowned across China. Scenic highlights in the city include Tianyi Pavilion, home to China’s oldest library; the 17th century Bund, which faces the confluence of three rivers; and the picturesque Dongqian Lake. The Westin Ningbo ([86-574] 8910-8888, www.starwoodhotels.com/westin/) offers clean-cut contemporary comforts, conveniently placed near Tianyi Square. This is good city in which to scout for small corporate meetings and venues for business get-togethers. The geography and proximity to Shanghai make it reasonably accessible, offering both value - should you so desire - and scenic distractions. If you don’t need to be downtown and fancy a splurge, Park Hyatt Ningbo Resort & Spa ([86-574] 2888-1234, www.hyatt.com) is one of China’s most spectacular resorts. Located in the foothills of Mount Fuquan, surrounded by terraces growing the region’s famed white tea, Park Hyatt’s first China resort has transformed an ancient fishing village on the shores of Dongqian Lake. From the outside, the white-washed buildings with sloping black roofs and winged gables create a classical hamlet scene, while inside tradition gives way to contemporary splendour with long marble halls lined with polished teak pillars and gallery-style art installations. Pick a bright blonde-wood Lake View room or opt for a corporate charcoal-wood Park Suite with huge bathtub and scenic views. Two of the village’s original 500-year-old structures have been magnificently restored. The carved wooden ancestral hall is now a Tea House hosting traditional tea ceremonies, and the ochre-painted temple is a chic cigar and whiskey lounge. Try this resorty escape for a leisure break or, combine work and play by hosting a corporate meeting here. Larger events and weddings can be arranged in the 674sq m pillarless ballroom. This area has its own private driveway and features a Chinese 'courtyard' foyer. In southeast Fujian Province, the port city of Xiamen looks directly towards the island of Taiwan, located 180km across the Taiwan Strait. The city is one of China’s most beloved tourism destinations on account of its beautiful islands, beaches and historic treasures. Xiamen Gaoqi International Airport is well serviced with direct flights to all major Chinese cities and regional commercial hubs including Tokyo, Seoul, Bangkok, Kuala Lumpur, Manila, Jakarta, Singapore, plus Amsterdam. The atmospheric Gulangyu, or Piano Island, is a premier attraction. The car-free island, a five-minute ferry ride from Xiamen Island, is filled with European-style architecture, beaches and quaint cafes. The PuShang Hotel and Spa Xiamen (late 2018, www.urbanresortconcepts.com) on Penang Road in the Huli District is a design hotel modelled along the lines of an urban resort. Unsurprisingly it falls under the management of Urban Resort Concepts, which runs the darkly alluring The PuLi in Shanghai, and guests will instantly spot the elegant DNA. Think clean zen lines, black trim with grey pastels, and a combination of woody homey accents and corporate minimalism with flashes of breathing greenery. A Grand Suite opens up the living space with more stretch room, light wood walls and neat cabinets and bookshelves stacked with books and artefacts. Need a spoiling residence or longstay? This could be it. The PuShang promises a splendid retreat for leisure trippers as well as business travellers on the go with breezy Marina views (if no actual beach). 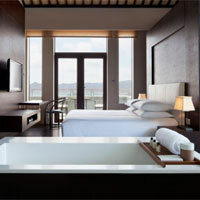 More on The Pushang Xiamen review as the hotel hits its stride. Looking out across the Harbour, the intimate Hotel Indigo Xiamen ([86-871] 423-4876, www.ihg.com/hotelindigo/) offers 125 colourful rooms with a designer flourish and indulgent bathrooms – alas, there’s no swimming pool or spa. On the slopes of Xianyue Hill with views across to Xiamen Bay, Le Meridien Xiamen ([86-592] 770-9999, www.starwoodhotels.com/lemeridien/) boasts a lush natural setting offset by a hip modern design and cool art collection. This 342-room hotel is a welcoming blend of leafy Zen and urban cool, just 15 minutes from the airport. Expect chic rooms with a Deluxe starting at 36sq m with a courtyard or hill view, a 37-inch flat-screen LCD television, rain shower, marble soaking tub, high thread-count sheets and plump pillows for a good night’s sleep. There’s a 24-hour gym too for all-day workouts. Ten meeting spaces take care of most small corporate meeting requirements as well as conferencing, with the ballrom accommodating up to 500 persons banquet style or 700 theatre style. Need a Xiamen conference hotels choice? Mark this one down in your diary. The development in these upcoming Chinese cities is emblematic of the mass evolution occurring in second- and third-tier urban centres right across the Middle Kingdom. Names flicking onto international tourist radars include Shenyang, Dalian, Ningbo and Xiamen. Small can be beautiful. Pack up and go.